It was in my early teen that I decided I didn’t like meringue. I don’t recall the day it happened, or why it did happen. It was just one of those days. Like one of those days where I decided to wear my mother’s 70’s jumper dresses to school, the day I asked my cousin to shave off her eye browse just to see how she would look like (which she did), or the day I truly believed that my sister’s and my bedroom was under the government security surveillance, or even worse under our parents surveillance. But if you would have asked me at that time why I dislike meringue so much, I would have given you the exact and same answer I gave to my sister two days ago. I don’t like meringue because it has a though and dry shell, a molar-sticky interior, an artificial looking coloring, it doesn’t melt in your mouth as it’s supposed to do and it’s sweet. Too sweet! The reason why I share this controversial relation with meringue is because of the funny looking meringue I encountered browsing the candy section in supermarkets. The commercial meringues remind me of the syrup my mother used to give us when we had a stomachache. It was like Pepto-Bismol but with two times the tongue coating texture for two times the: “Ewwww! Ewwww! That’s gross”. I had this image of meringue for over 15 years now and no one has ever been able to change it. No one but a man, his book and five leftover egg whites in my fridge. Jacques Pépin’s “complete techniques” is a real treasure to have in the kitchen. It has more than 1000 cooking methods and recipes, all demonstrated in step-by-step recipes. It has some precious tips and tricks from the master him self, and when a man gives you a basic meringue recipe and start raving about how delicate and tender it is, and how with one basic recipe you can make Vacherin, Dacquoise, Ladyfingers and Oeufs a la neige, you’d better roll up your sleeves, swallow your nose-wrinkling pride and start making some meringue and enjoying it. Oh! And how I did enjoy it. It doesn’t matter what I said before about molar-sticky whatever meringue because yesterday I’ve fallen head over for my angel kisses meringues. And as if it wasn’t enough I added some bittersweet chocolate ganache filling to cut down on the sweetness a bit and because any reason is a good reason to smear some chocolate. When you bite into the meringue kiss you have a slightly crunchy shell with fluffy spots and then it starts to melt on your tongue leaving the chocolate behind as the finishing touch. 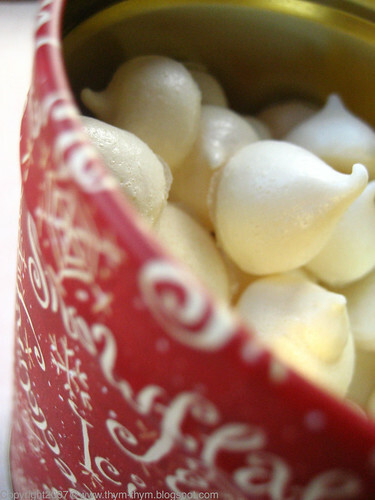 I have about one hundred and fifty five meringue kisses in my cookie jar right now. And being the cuddling person that I am, I can never have enough kisses in a day. Using a stand mixer fitted with the whip attachment, whip the whites, adding a few drops of lemon juice or a small dash of salt before you start t whip. Whip on medium to high speed. When the whites are holding a nice shape, gradually add ½ cup of sugar and keep beating for 1 minute. The mixture should be stiff and shiny. Fold in the remaining sugar using a spatula. Folding in a part of the sugar at the end makes for tender meringue. Coat a cookie sheet with butter and flour, and remove the excess flour. 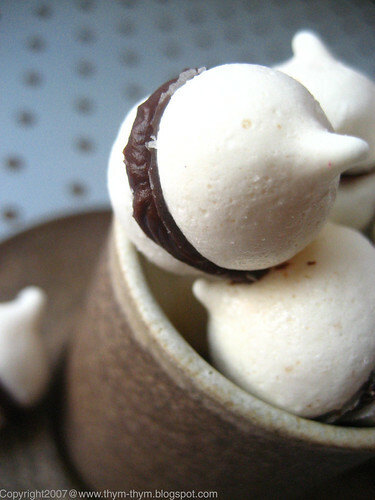 Fill up a pastry bag and pipe out plain or fluted meringues kisses. Lift the tip of the bag in quick, swift motion to avoid a long tail. Bake them in preaheated 190F oven for 1¾ hours, or until they are dried. You can prepare the meringue in the evening, preheat your oven to 375F, put your meringues in the oven and turn it off. Leave them in there all night to dry out. Stored dry (without the filling) in a covered container, meringues will keep for months. 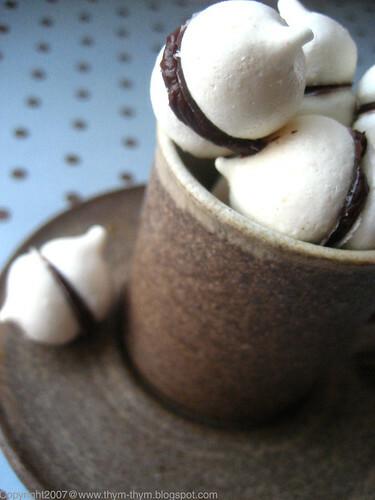 Spread some of the chocolate ganache on some meringue kisses, and seal with the remaining plain kisses to from a macaroon. Let the chocolate set a bit and serve. Dans un mixer Kitchen-Aid munis d’un fouet, battre les blancs, en ajoutant les gouttes de citron ou le sel avant de battre. Battre à une vitesse moyenne à haute. Quand les blancs commencent à prendre du volume et une bonne consistence, ajouter la moitié du sucre petit à petit. Continuer à battre pendant 1 minute. Les blancs doivent etre volumineux et brilliants. Incorporer délicatement à l’aide d’une spatule le sucre restant. Ce process est coseillé pour avoir des meringues tendres. Beurrer et fariner une ou deux plaques de cuisson et enlever l’excès de farine. A l’aide d’une poche à douille, faites des petits tas d’1 centimetre de diametre. Retirer la poche à douille rapidement pour qu’un fil de meringue ne se développe. Cuire dans un four préchauffé a 90C pendant 1¾ heures, ou jusqu’a ce que les meringues soient seches. Autre alternative serait de préparer les meringues le soir, préchauffer votre four à 180C, mettre les plaques de meringues au four et etteindre ce dernier. Laisser sécher pendant toute une nuit. Les meringues peuvent se conserver, sans leur ganache, dans une boite hérmétique pendant des mois. Répartisser un peu du ganache sur une coque de meringue et coller la deuxième coque. These are lovely! I have a similar recipe in my "to-bake" stack, but I haven't decided if I'm brave enough to make them yet. Too cute Rose! They are so perfectly shaped! Even though I use a piping bag, look out, my stuff always gets out of control for me. I am glad I am not the only one who gets up "groggy" either! Usually takes a good strong cup of black tea to get my wits gathered! These are adorable!! I never realized meringues would keep that long - this would be a wonderful treat for me, because there are only 2 of us, and things always go to waste! Oh, my, I am enchanted by those photos. Truly. Those kisses look like they would melt in your mouth -- beautiful! - Jennifer, I had the same apprehension, but really they aren't that hard, and even fun to make with all the piping. Glad you like them. For me, it takes me a big bowl of cold milk and my hubby joking and kidding around. - Deborah, thanks my dear. With only my husband and I, I am pleased to see that meringue keep that long without going bad and having to throw them away. I feel really bad when I have to do it. - Anh, thank you my dear. - Susan, thank you very much my sweet Susan. Between us, I kind of like them too . - Christine, thank you very much. Just stop by one of those days when you're in the area. And I'll give you a box of my meringue kisses. Ok? - Lydia, thank you very much. They are indeed a sweet cloud in your cloud. No need to use your teeth. I'm not a huge fan of meringue, but these certainly are a different kind. With chocolate, even better! These are SO sweet, Rose. I don't know if I would have the patience for them, though. My house if full of sweets right now, thanks to a cookie swap we just had. These would have been a nice addition..
Shame on those supermarket meringues that turn people off so! A good meringue is just so... ahhh... angelic! Your's love divine! yum, i made a variation on these and they are so fabulous! so pretty too! What a magnificent triumph over store-bought meringue! Jacques Pepin is the best - I keep his hot chocolate mix in the house at all times - especially the one named "Wicked" which has chili and cinnamon. Yumm. Meringue's always been one of my favorites, but you've inspired me to try his version nonetheless! Love the chocolate ganache too. Uck to store bought meringue! Yours however are too cute for comfort, love the even shapes and the cute little tip on top. Just beautiful meringue kisses. I am glad you are a fan of them now. Just wanted to let you know I "borrowed" your Chocolate Kisses link to include in a post I did in celebration of today being the Hershey Kisses birthday!